The team of teachers at the Tharwa Valley Forge bring a wide range of experiences to the courses. They are selected not just for their technical skills, but also for their people skills. To be encouraging, patient, flexible and passionate make our teachers more effective in introducing students to our art and to get a great result. Karim began his journey with knifemaking under Master Bladesmith Thomas Gerner in 1995. Thomas was the first Australian Master Bladesmith from the prestigious American Bladesmith Society. 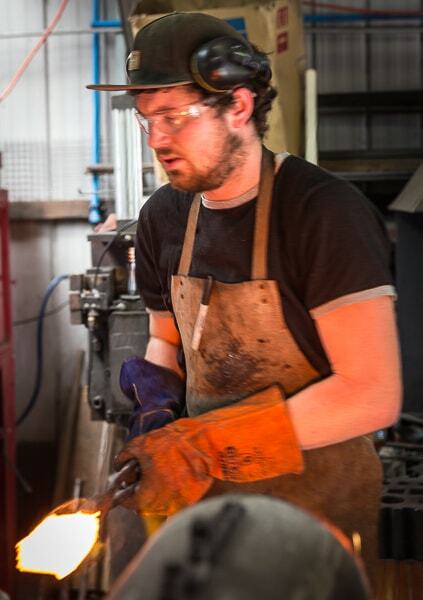 Karim has developed his skills in the area of blade forging, heat treating steel, handle construction, sheath making and leatherwork. 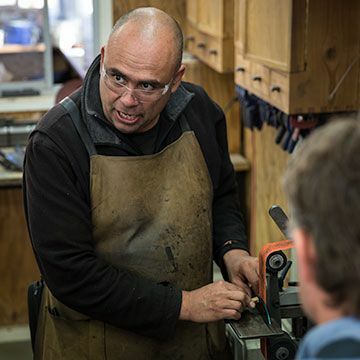 He has been teaching knife making since 1998, and created the Tharwa Valley Forge to provide further opportunities for teaching and learning in 2003. He currently teaches courses in Knifemaking, Forging, Damascus and Sharpening as well as making custom knives to order. He is the President of the Australian Knifemaking Guild (AKG), and has previously held the position of State Representative of the ACT/NSW branch of the AKG. Karim was an Outdoor Educator for over 13 years with Outward Bound Australia, designing and running personal development programs for youth. He also ran a prestigious national leadership program with the Australian Rural Leadership Foundation for 5 years. Karim holds a Certificate IV in Workplace Training and Assessment and has used his extensive experience as an educator to develop and refine the courses delivered at Tharwa Valley Forge. Dean was hooked on Tharwa Valley Forge from the very first moment he took a course here. He went from helping tidy up and setup classes in exchange for workshop time to making his own blades. One day six years ago, Karim challenged Dean to make two razors - something Dean had never tried before. Using Karim's knowledge and conducting his own research, Dean designed and made two razors using Damascus Steel and Buffalo Horn. Dean saw that no-one else was making razors in Australia; although many knifemakers try making razors at least once, no one was doing it with any regularity. He decided to challenge himself to learn all he could about razor making, and has since become the largest razor maker in Australia. 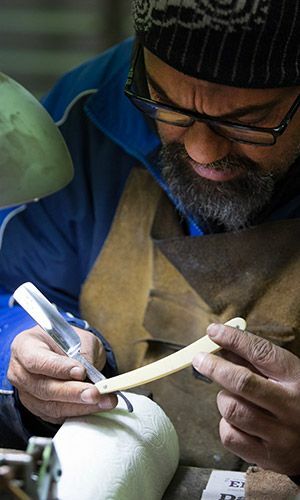 He now makes handmade custom designed razors in both traditional Japanese and Western styles. As his reputation began to spread by word of mouth, Dean was sought out by clients seeking restoration of their heirloom razors. He is frequently called upon by clients from around the world to restore cut throat razors that have been passed down through generations. His unique skill set combined with the top of the line equipment at Tharwa Valley Forge ensures that his restorations are second to none. Dean has taught over 20 Razor Making Courses so far at Tharwa Valley Forge and says that he finds people who attend his razor making course have two main concerns: "how do I keep my razor sharp? ", and "how do I use a razor without cutting myself?" Because of this, Dean's courses not only cover the practical elements of razor making, but also cover the correct use and maintenance of razors, including exploration of elements of razor design such as edge geometry and symetrical versus asymmetrical hollow ground blades. Being an expert on making razor sharp edges, Dean also teaches our highly-regarded Sharpening Classes. Leila has been making knives since she was 6 years old. 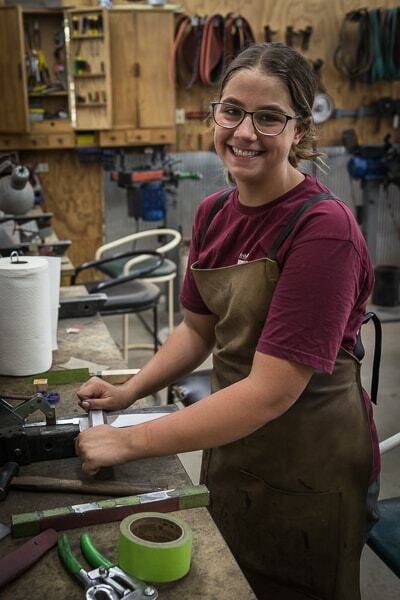 Having first crawled into her father's workshop as a toddler, she developed a keen interest in hammers and fire. At five, she operated the 30-ton hydraulic power press by standing on a bucket to reach the controls. Now much taller, she uses the press to create her own Damascus steel (and no longer needs to stand on a bucket). Leila started her bladesmithing career specialising in cooking knives. Because of their unique provenance and high quality these knives were highly sought after by professional chefs and collectors alike. At age 11, Leila presented a forging demonstration at the 2014 International Cutlers Exhibition in Sydney. Later that year, Leila was one of the guest presenters at Ben Shewry's WAW Gathering in Melbourne. Speaking on the importance of making things, she impressed the 300 delegates from the catering industry with her no-nonsense advice and confident delivery. 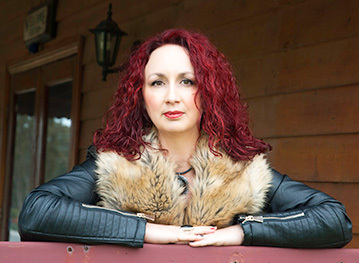 In November 2016, Leila spoke at the YMCA National Convention in Adelaide. Speaking to the gathering of young people she stressed the value of a “Do It Yourself” mind-set and the importance of self-reliance, as opposed to relying on modern consumer culture to supply them with the latest and greatest. Leila has donated a number of knives to raise funds for charitable organisations. In October 2016, a knife Leila donated to the ACT's palliative care facility, Clare Holland House set a new personal record when it was sold at auction for $4,100. In 2017 anoher one of her knives sold for $4,000 for the same cause. She is a regular at the knife shows around the country where she sells a diverse range of her own knives. Leila teaches Japanese Knifemaking and Junior Blacksmithing at the Tharwa Valley Forge. If you're interested in buying one of Leila's knives, please check out her Instagram as they sell-out very quickly. Scarlet Bennett is a mixed media artist who works primarily with metal using silversmithing, coppersmithing and metal work techniques. She uses recycled silver, upcycled metal, copper, brass and found objects, along with traditional materials and gemstones, to create distinctive, unique pieces. Scarlet gets much of her inspiration from nature and her work features colours and themes from the scenes that inspire her in the natural world. She is an experimental artist who continually seeks out new artistic challenges and new ways of incorporating other art forms - such as painting and sculpture - into her work. Scarlet has been making bespoke pieces of jewellery on commission since 2011. You can see more of her work on her website. Adam began making knives as a young man, but the demands of family and career meant that he put his hammer down for a few years. Adam went on to spend many years working in a wide range of technical and trade roles, including as a mechanic and metal fabricator. Some years after he last made a knife, Adam was exploring creativity as an escape from the stresses of day-to-day life when he rediscovered his passion for bladesmithing. His experience in the trades combined with his previous foray into bladesmithing lead him to develop both a formidible skill base and home workshop. 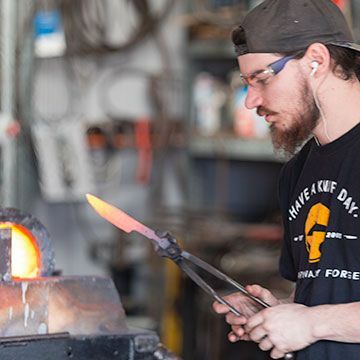 Adam's keen technical mindset and deep well of creativity has seen him create a diverse range of unique knives, including high quality stainless steel fishing knives, Damascus steel art knives, Steampunk inspired barrel knives, and his highly sought after cheese axes. Asides from being an accomplished bladesmith, Adam is an artist that works in metal, wood, leather, and plastic. 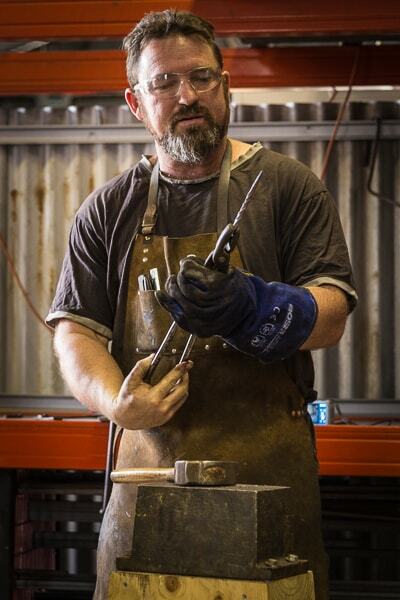 Adam is one of a handful of full-time bladesmiths in Australia, and works at Tharwa Valley Forge creating custom knives, production orders, and teaching a variety of Bladesmithing courses. A knife maker since 2008, Jackson has worked at Tharwa Valley Forge since 2016 making custom knives and teaching classes. Inspired by Master Bladesmith Jerry Fisk and motivated by Karim, Jackson aspires to constantly push his creative limits and grow as an artist. With a lifelong affinity for recycling and machining timber, Jackson has previously worked at the iconic Canberra joinery, sawmill and recycled timber yard Thor's Hammer. Jackson's personal blade brand, Phoenix Knives, reflects his extensive use of recycled and repurposed timber and metal. He often works with materials from old buildings, street trees, and obsolete machinery imbuing his creations with a history of their own. The most interesting knife Jackson has made to date was a custom knife made entirely of items from a rural property. The handle was made from a tree that had been struck by lightening, the fittings were made from copper pipes dug up from the property, and the blade was forged from the leaf springs of a 19th century horse buggy from the property. Asides from being asthetically pleasing, Jackson loves working with timber because it is always alive and moving; many people don't appreciate the fact that timber is always moving in response to its surroundings. This fact combined with timber's fascinating mechanical properties makes Jackson feel that timber provides an excellent challenge to his creative abilities. In addition to timber, Jackson enjoys working in Damascus because its nature complements that of timber and echoes many of wood's characteristics. For Jackson, working with Damascus evokes many of the skills required for working with wood, and he uses it in his designs to complement the features of the exotic hardwoods he often works with. Jackson spends most Australian winters in the United States where he runs a summer camp for teenagers. Although we miss having him around, Jackson enjoys never experiencing winter and the challenge of working with young people (which proves to never be boring). Hailing from Orange in NSW, James has long enjoyed creating things with his hands. Unfortunately for James, his home town did little to fulfill his passion for creativity, as the only opportunity to make things with his hands was making pizzas at the local pizza shop. Seeking to broaden his horizons, James undertook work experience at Tharwa Valley Forge. His creativity and skill caught the eye of Karim, leading James to move to Canberra to pursue a career as an Artisan. Having studied Metal Arts at TAFE, James is a skilled fabricator that has made everything from practical everyday items such as seating and work benches, through to art installations of his own design. James is now an Assistant Cutler at Tharwa Valley Forge and is developing into a skilled Bladesmith. He makes production knives and cutlery at the Forge, and assists with the conduct of courses. In addition to loving his job, James is very happy to have access to a comprehensive workshop where he can continue to grow as a creator and knife maker.